Looks tasty...does your daughter ship? But she makes the best sand-cakes. 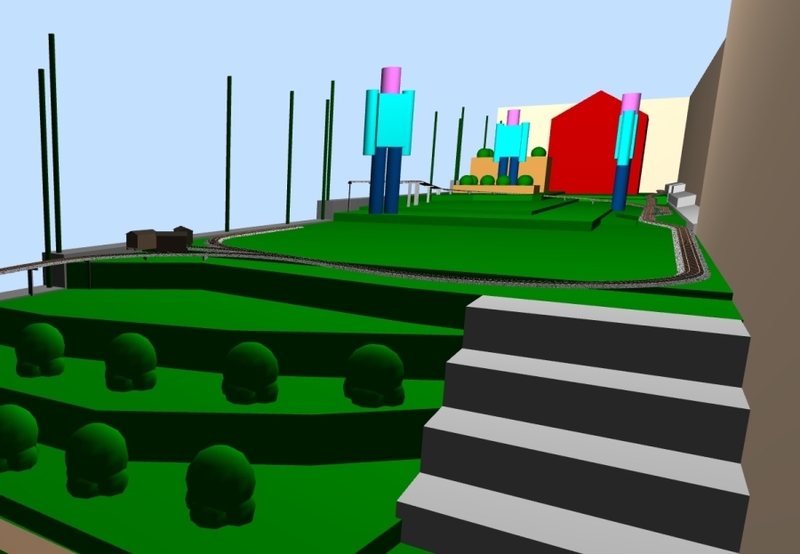 since I’m still unsure about the final layout plan in the upper garden, I spend some more attention to Ronja Springs. At the right loading spur, I announced some industry. So let’s get started. 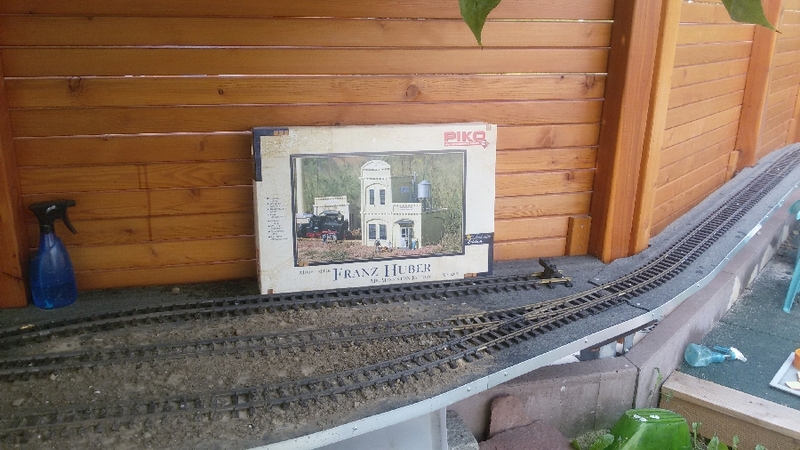 Piko had a special offer for the furniture works “Franz Huber” (aka Mr. Mann’s Cannery). Since the space allows only background relief building, the Piko kit is a perfect base for kit-bashing, while the building is build from modular pieces, which can be rearranged very easily. 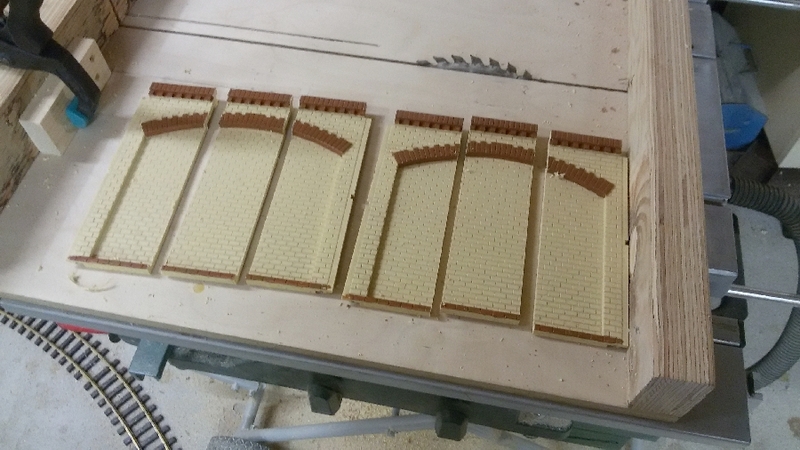 Beside the kit, I ordered a bag of additional columns to attach the wall segments together. 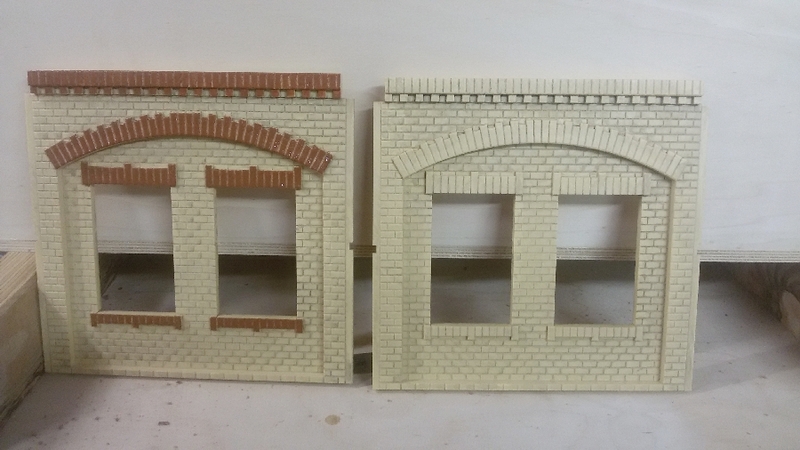 While the cream-uni-colored structure looked somewhat boring, I decided to paint all the embossed bricks. It was quite some work, but turned out very nice. 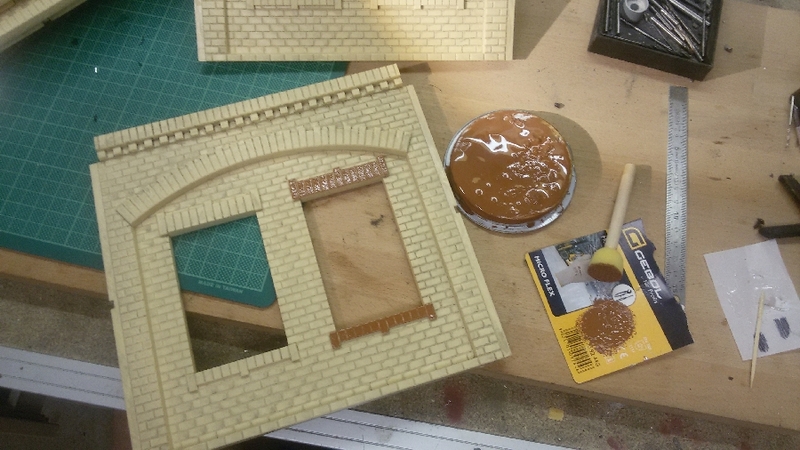 I also painted the corner and connecting columns. The last photo shows a first test-fit. 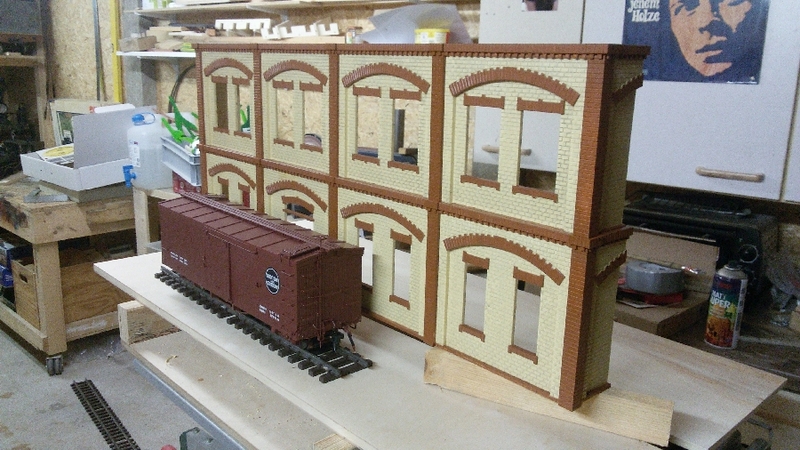 The whole structure will get a foundation to raise the door in the center to the level of the freight cars. This will become the loading door for boxcars. That is a great use of the kit and will add depth to your scene. I like the contrast paint. Let’s go to part two of the furniture works. The two wall segments without windows got cut on the table saw to make the small side wall segments of the relief structure. I rearranged the walls of the building from the original idea to a 2×4 pattern, which fits better into the space I have available. 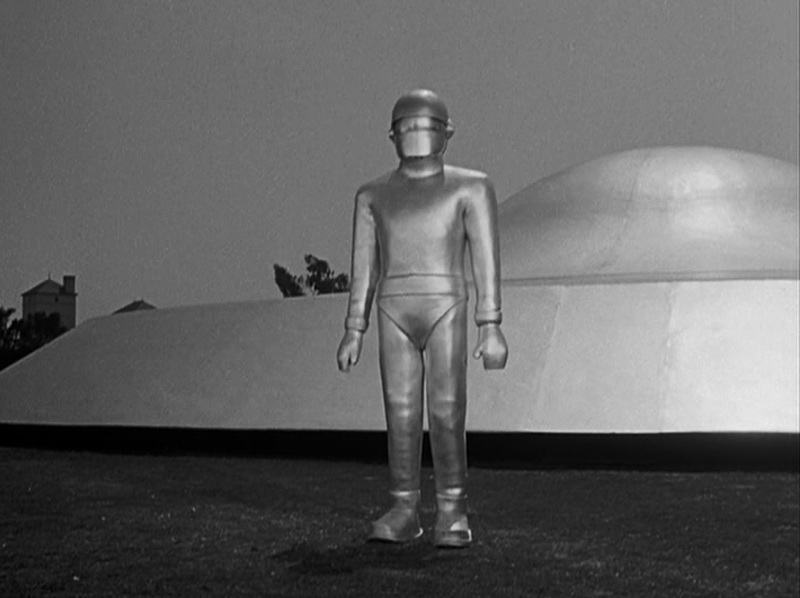 The first ideas came out to big in my opinion. 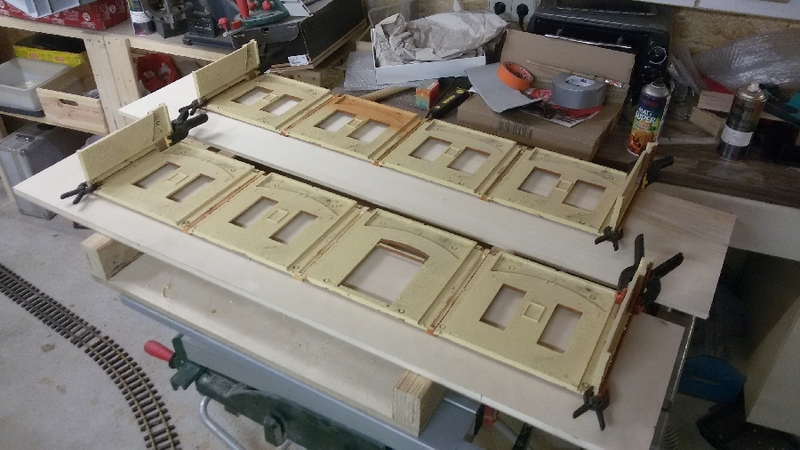 I glued each floor level together and finally both wall segments together. To enforce the whole structure, I added plastic channels and triangles on the inside. 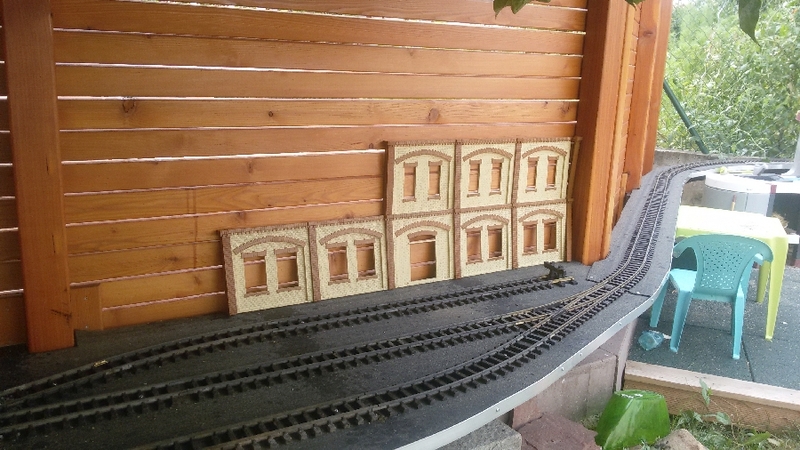 Before I installed the windows and doors, I gave all bricks a wash of thinned brown paint to blend the bright cream bricks more into a brownish-yellow. The blue windows got also repainted and with the roof in place, the main part is done. Still missing are the foundation and some details parts. You could cut a door in the wooden screen and reach from the back side and load and unload the box car! Very impressive! Keep up the good work and the pictures coming with updates. 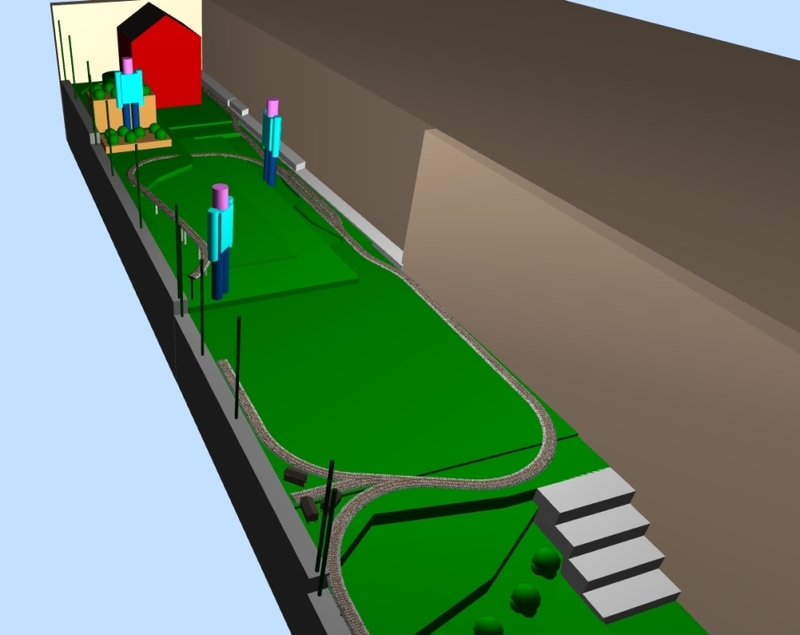 I had some trouble and issues with my original layout designs and after dozends of other ideas, I'm pretty sure that I now have the best trackplan for my personal garden railroad. Once I got rid off all the stupid ideas I had as well as faulty compromisses, I ended with a pure and iconic logging railroad. I'll start with some overviews. Unfortunally, the second one is 180° rotated. 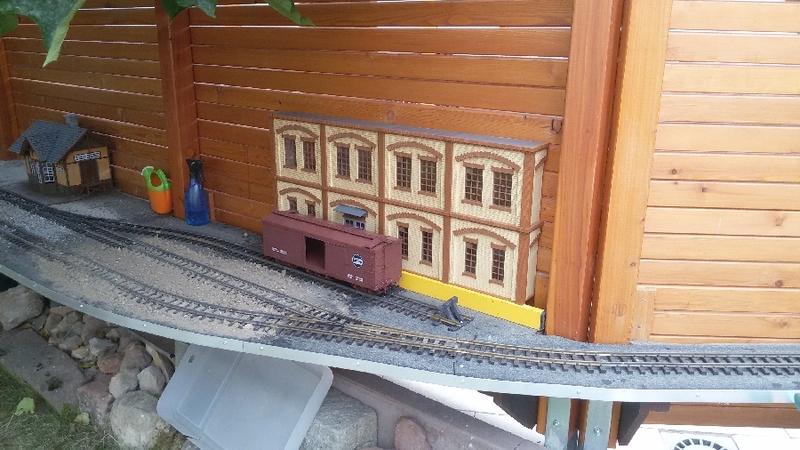 The lower station "Ronja Springs" got some small updates. 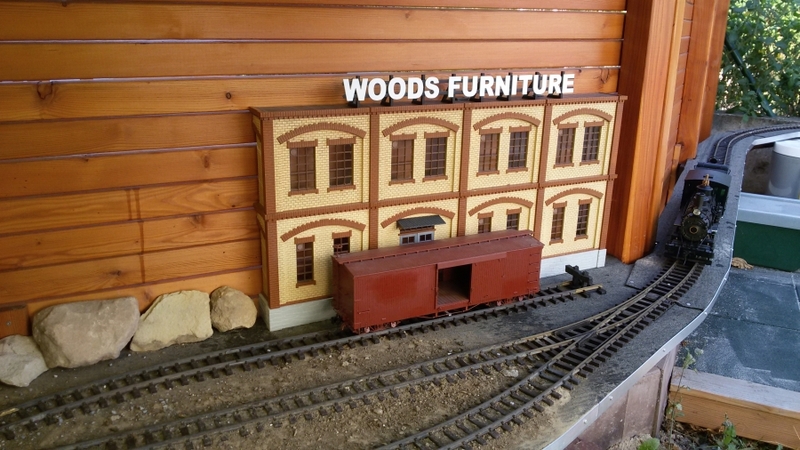 The furniture works moved form the right to the left spur track and will provide 2 car spots to serve the factory with freight trains. 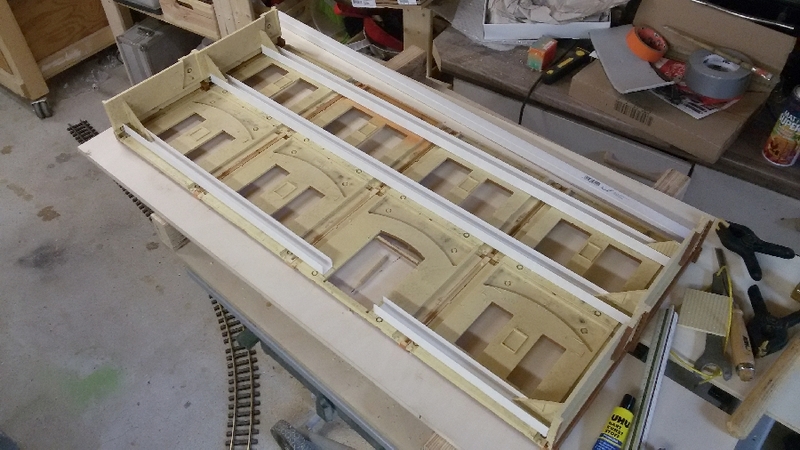 The sawmill area will stay at the far left end of the layout. There will come a relief structure for the sawmill as well. The "12"-scale dolls" are a good help to get a feeling for size and dimensions. The upper garden got now totally redesgined. Going around the back of garden shed is not practical and there were some other ideas I had to put into the trash bin. 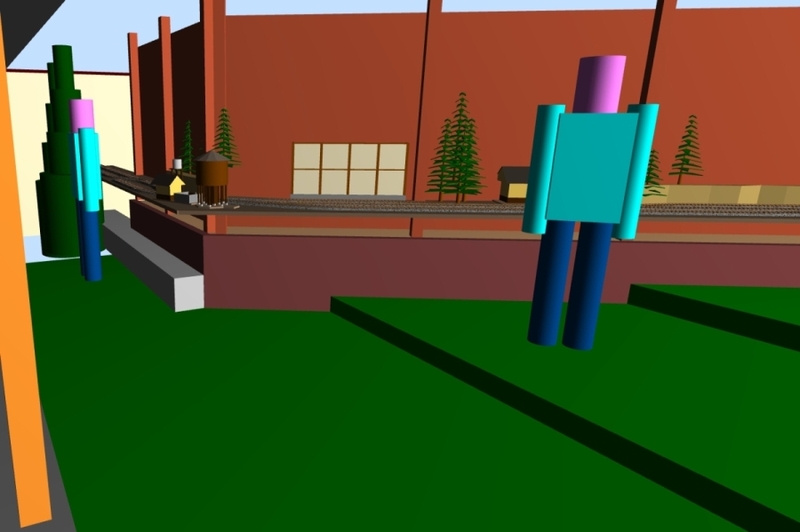 the new design features a pure logging railroad paradise. There'll be a small logging camp near the old log-loading spur. This section is seldom used for active logging, but to store supply cars of the logging railroad. The mainline continues to a backwoods-siding. Light-Green indicates grades up to 2.5%, darg green 3.5% and red track will go up to 6-7%. Two more logging sides are connected via these steep grades. 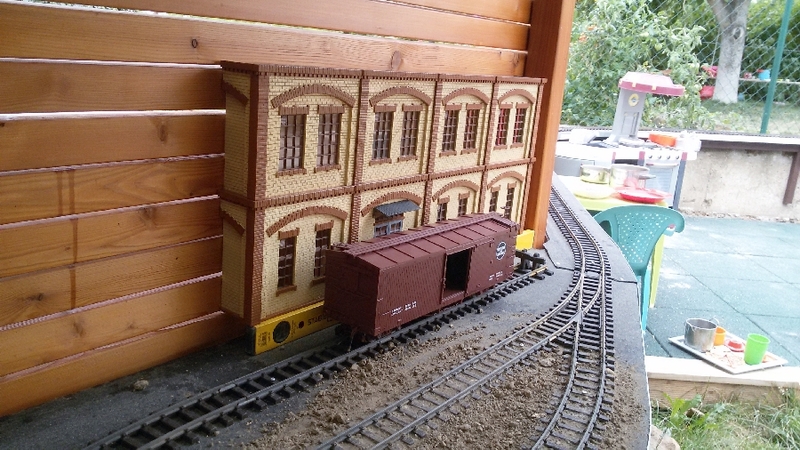 Log trains are handled in single and douple strings of log cars. A single string will contain 4 skeleton log cars (or 3 log cars when running with the Romanian CFF stuff). A train heading out of Ronja Springs may pull a double string up the 3.5% grade to the backwoods siding. Here the train is split and pushed in single strings to the loading sides. 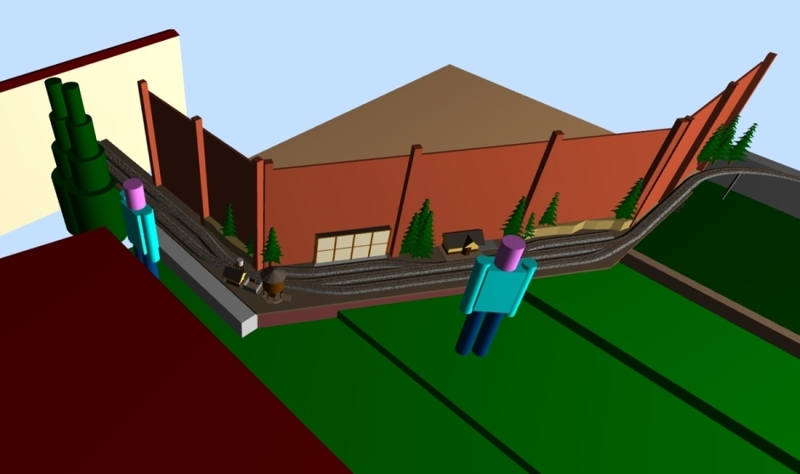 Once the loaded strings of cars are collected at the siding, a train with a double string (8 cars) will head down to the mill. 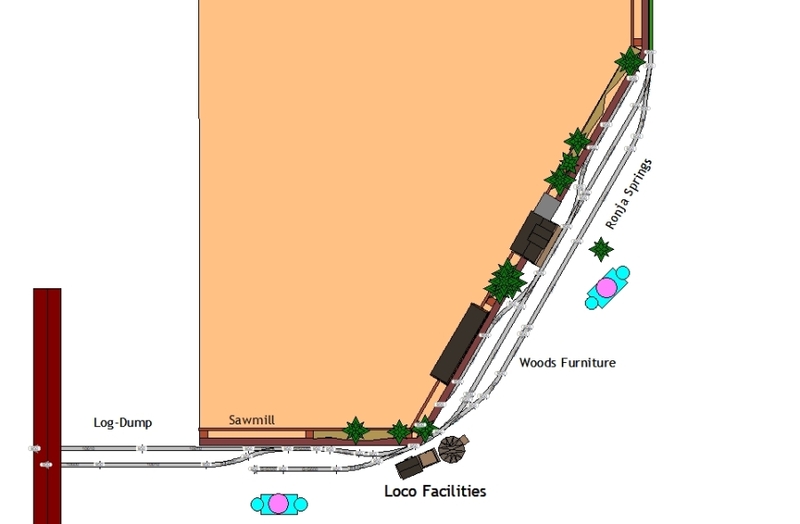 The logging camp and old log landing will be served from uphill-trains if necessary. 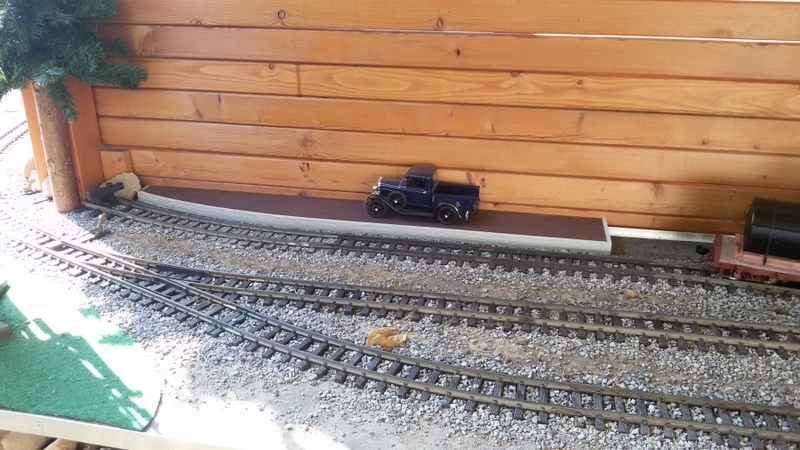 Beside the log trains, I'll also run some Shay powered freight trains to serve Ronja Springs. These may run uphill as well to the backwoods station, which than might be used as stagging yard for the freight train operation. The log camp and spur might be used as industry spurs. Except for Ronja Springs, all other structures might be exchangeable for special purpose. That's for now, more soon. All I can think of after seeing your figures ..
yes, the dools are not my best work, but it's hard to create something "human" with the tools provided by SCRAM. Anyhow, I've some news from Ronja Springs. 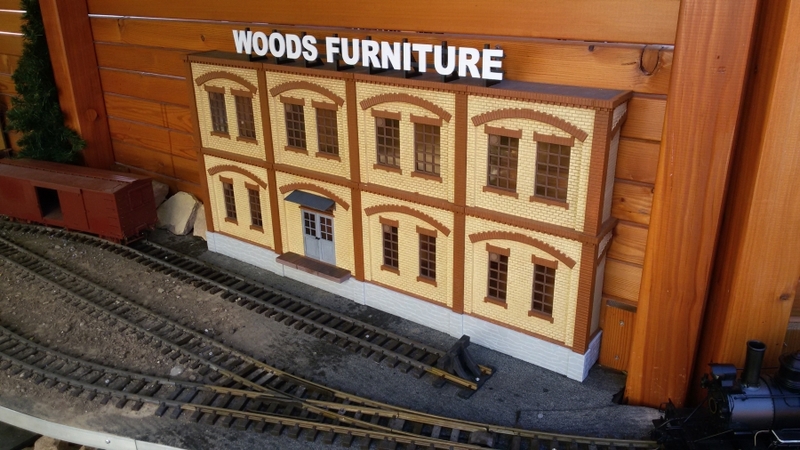 The factory building of Woods Furniture got the company name added to the roof as well as stone basement to raise the door up onto the floor height of flat and boxcars. 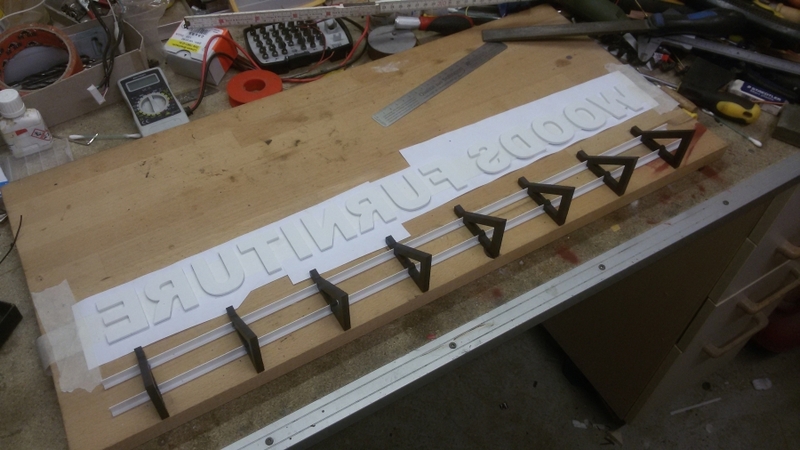 The letter and girders are cnc-milled from styrene and PVC. 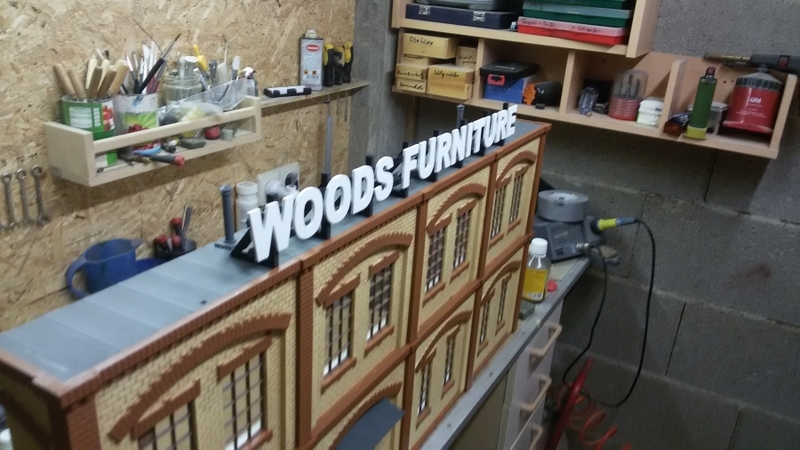 I used some PVC T-profile to support the letters. Assembled on top of the roof. Next I raised the while structure on top of a 2" basement. This will bring the door step on perfect height with flat cars or box cars. 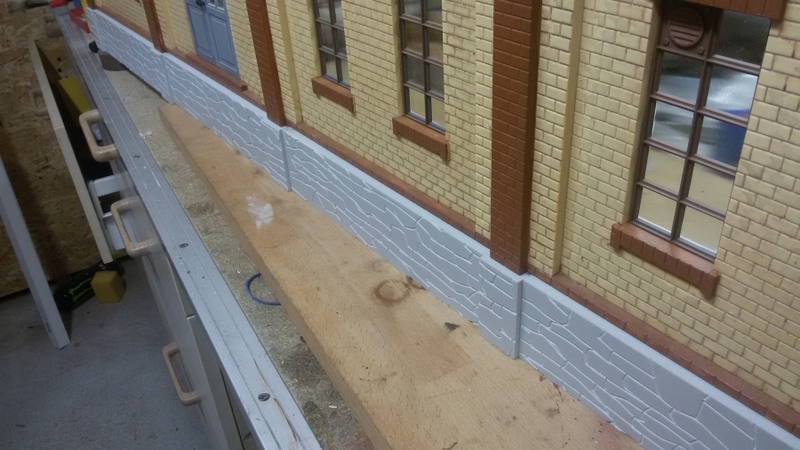 I got some PVC board with stone engravement which I ripped into stripes and glued them together to match the profile of the factory walls. And here's the finished factory located at Ronja Springs. 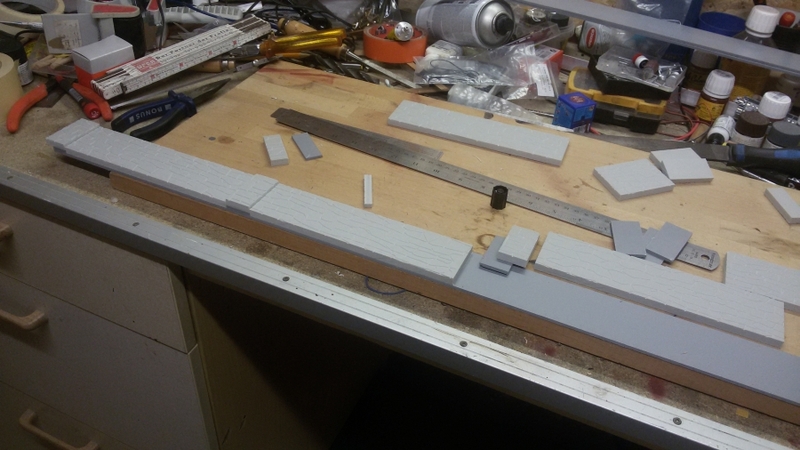 And while I had some stone-wall-strips left, I made a 1" height platform for the team track. Cool. As for weathering, nature will take care of that. Gerd, I did.. pot O coffee and watched the video. Pretty cool. I have a question... where did you get those decals made? I made the letterings myself. What you can see at the moment is simply printed on a laser printer using white selfadhesive foile to make stickers. For the still missing road numbers on the cars and S.P. lettering, I'll use laser-cut stenciles and my airbrush. My dad has a small laser-cutter and will make the stenciles for me. I'll take care of this in onw of my next blog-posts and will share here with you as well, but this may take some more weeks as I'm very busy at the moment.